The PGFV Sanctuary was initiated in the year 2001 when a family of gorillas was transferred from the Centre International de Recherches Médicales de Franceville (CIRMF) onto the island of Evengué-Ezango, located just north of Loango National Park in Gabon. 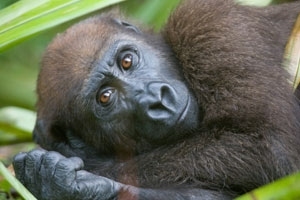 Though the initial goal was for these gorillas to access the entire island where they could roam free, it soon became apparent that their life histories, as well as the level of adjustement required from life-long captivity into a larger natural setting, did not allow for a full release onto the island. Thus, these gorillas were transferred into a forested enclosure, hence how the gorilla Sanctuary started. Reintroducing these gorillas into the wild is not possible since they have lost some key survival skills (usually acquired from birth until about 6 to 8 years of age) and have become habituated to humans. As victims of the bush meat crisis, the Sanctuary gorillas play a very important and special role as conservation ambassadors. Through education and responsible low-impact tourism, the PGFV hopes to contribute to raising global awareness on the on-going bush meat crisis that is leading to the disappearance of all great ape species in the wild.